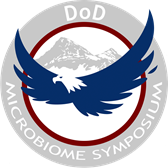 We are welcoming anyone who would like to join us online for the DoD microbiome symposium to be held at the United States Air Force from 5-7 April (see schedule below). The symposium will explore current and future research directions in the human and built environment microbiome that may benefit the DoD, Veterans, and their Families. A major goal of the symposium is to bring together DoD microbiome researchers and program managers together to encourage collaborations across services. We will have researchers attending and presenting from multiple agencies from Army, Navy, Air Force, and Veteran Affairs. Also in attendance will be program managers from DARPA, DTRA, Office of Naval Research, Air Force Office of Scientific Research, Army Research Office, and Henry M. Jackson Foundation. With our desired goal to increase collaboration, the symposium was limited to 50 participants (although we stretched to 60). Given the interest, we have decided to live-stream the talks in the symposium to anyone who would like to listen. We will also track questions and ask them if there is time. Funding for this symposium was provided by the Alfred P. Sloan Foundation under the research project to track the cadet microbiome. Link for live stream will be on website (https://www.mirecc.va.gov/visn19/mvm/) and twitter (@MVM_CoRE) a few days prior. If you have any questions please don’t hesitate to contact me at Andrew.hoisington@usafa.edu. Does anybody have the link to live stream this symposium? I am unable to find it.